The 67th International Motor Show in Frankfurt was quite an experience! Rightware participated in the New Mobility World exhibition for six days of demos, meetings, and presentations. We enjoyed seeing so many familiar faces, making new connections, and spending day after day discussing automotive UIs and the connected user experience. IAA offered a great opportunity to present the Kanzi story from end to end. Visitors began with hands-on demonstrations of Kanzi Studio, our core UI development tool, and witnessed live UI deployment to Kanzi Runtime on commercial hardware. Our staff even took requests, demonstrating Kanzi Studio capabilities in virtually every domain imaginable! Visitors could then see a full instrument cluster design, a responsive UI design for IVI applications, and navigation with real-time 3D rendering of HERE Maps with Kanzi plugins. This deep dive into Kanzi UI was followed by demonstration of several use cases for Kanzi Connect, our latest product enabling any data and any services on any display. This included integration of the IBM Watson AI platform to form an Intelligent UI, as well integration of three devices into a single virtual user interface across multiple displays. Finally, all this came together with an e-Cockpit developed by our parent company, Thundersoft, showing Kanzi-powered UIs on a QNX-based cluster and an Android-based IVI system, seamlessly integrated with Kanzi Connect. The New Mobility World Speakers’ Corner featured two Rightware presentations, including this one on Augmented Reality as a Stepping Stone to Autonomous Driving. Over the next month, we will be posting weekly videos from the event, with highlights from several of these demonstrations. Check back on our blog often! 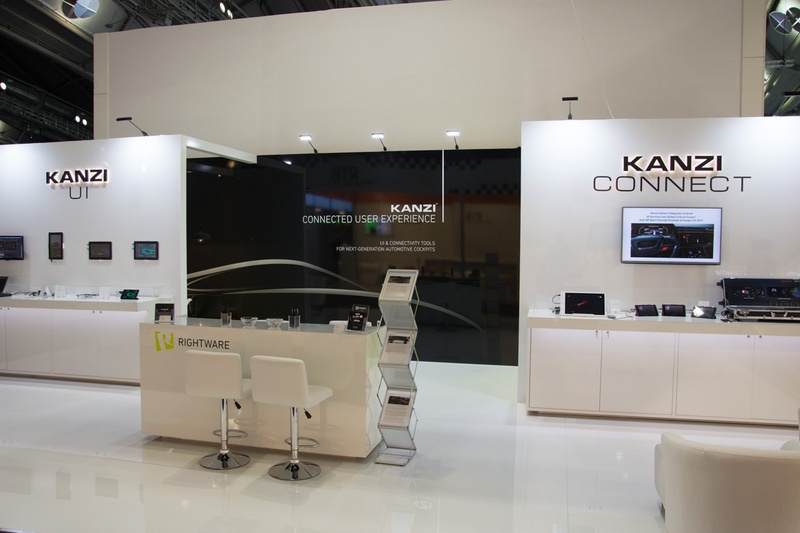 To learn more about Kanzi UI or Kanzi Connect, please visit www.rightware.com, and follow us on Twitter at @RightwareLtd, on LinkedIn, and on Facebook.